Titans is an American web television series that is released on DC Universe, based on the DC Comics team Teen Titans. It premiered on October 12, 2018 on Netflix and its first season comprised eleven episodes. Upon its release, the series received mostly positive reviews. Even ahead of its premiere, Netflix Titans was in fact already renewed for a second season. Marvel and DC have been in a tough fight ever since the craze of super-heroes movies started; and Marvel has clearly been winning. One after another, they have been bringing new super-hero characters on screen and almost all of their movies have done great business at Box office. DC has been trying to match Marvel’s performance but unfortunately has failed at it miserably so far. Except for Superman and Batman, they have not been able to bring anything that could invoke public interest; and to be honest, even the Superman or Batman movies weren’t that impressive. The Justice League movie which was supposed to be DC’s reply for Marvel‘s Avengers was a pain to watch. Recently however, after the Wonder Woman and Aquaman movies, things have started to change a little for DC. I am not saying that both these movies were amazingly good but at least were better than the other DC offerings. 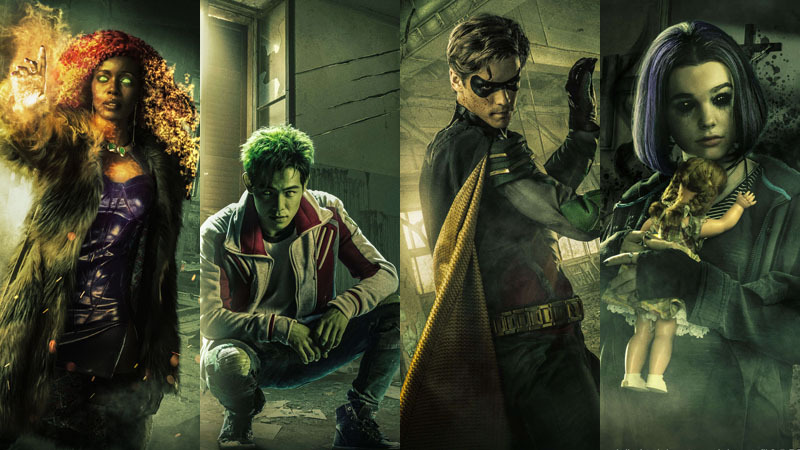 The newest entry in the list is the Titans Series produced by Netflix which I just finished watching; and must admit that I was very and pleasantly surprised by it. You will have to be patient and sit out the first couple of episodes for the story to grow on you though. My first thought as I watched the first episode was stop right there because it starts in the same gloomy manner that all the other DC movies do. It was the same sad depressing environment, same rainy dull weather and same talks about how crime in Gotham city was on rise and how it was becoming uninhabitable. This more or less has become the theme of everything by DC. They way Gotham city is portrayed, it must be the saddest and most sinister place on earth to live. If I was living there in reality, I am sure I would have either committed suicide or move out at the first chance I got. Thankfully, the lead hero (Robin of Batman & Robin) too moves out of Gotham in the very first episode and the entire story is set up in Detroit. And from there, it is an engaging and quite impressive show till the end. Acting, choreography, CGI, production, editing, dialogues were all well done. Interactions are really promising, narrative is captivating and the episodes actually made sense. The overall environment wasn’t as gloomy and depressing as rest of DC movies and shows. Overall, by the time the show ended, I could actually say that it was finally something worth watching from DC; something that actually is in league with the Marvel has been producing. My only complaint was that the series still had a bit of dark atmosphere that could have been toned down even further. Without putting in any more spoilers, I will recommend that you watch this show with an open mind. Do not fall for all the negative reviews. It is in fact a great show that deserves the credit. The pace of the show will keep you interested throughout. It never rushes and will also not get too slow to be called dull. There was not even a single moment when I was uninterested or bored. The story kept me gripped and the action was above average for TV standards. The story has a lot of potential and I am already waiting for Season 2. I just hope they do not go downhill from here and keep it as refreshing as Season 1 was.